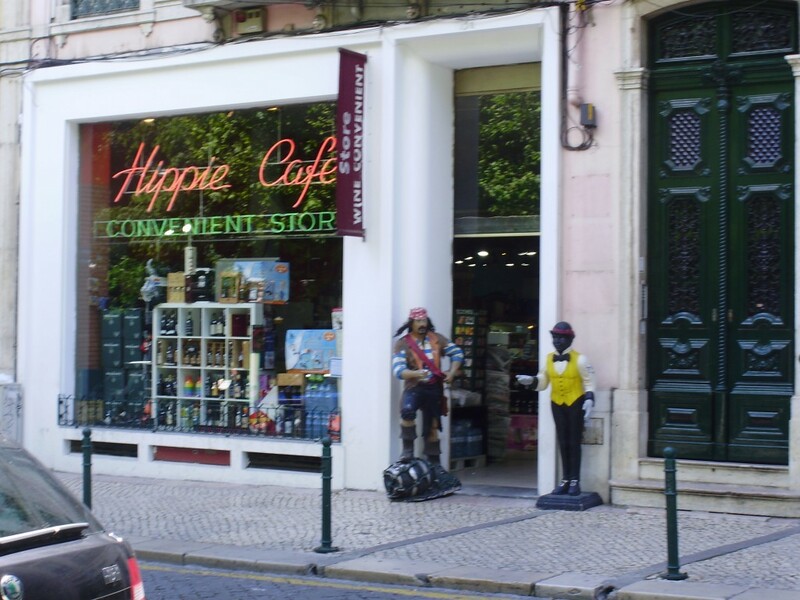 The second port of call on our 2009 trans-Atlantic cruise was Lisbon, Portugal. While had taken a shore excursion on our first stop, Tenerife in the Canary Islands, we opted to check out Lisbon on our own. 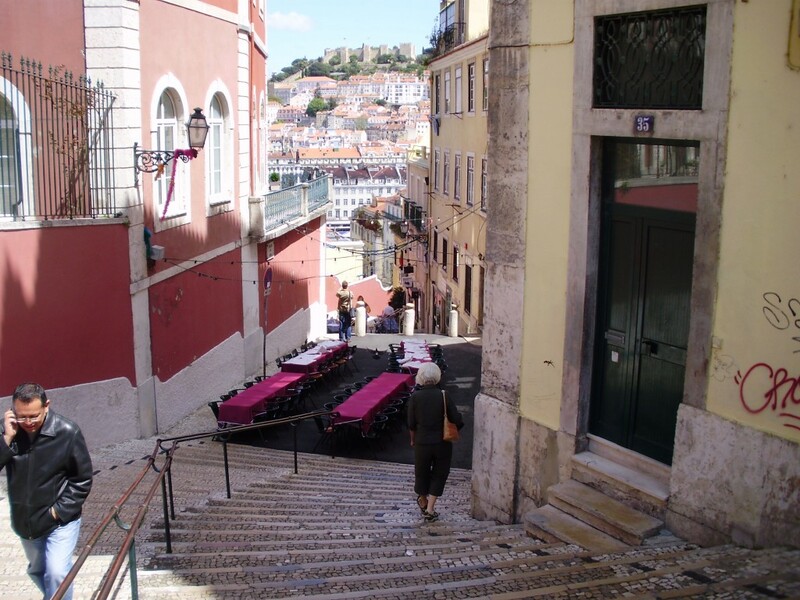 Upon disembarking, there were free shuttle buses to transport us to the Baixa and surrounding districts which make up the historic centre of Lisbon, much like the 20 arrondissements make up the historic centre of Paris. Lisbon has a lot of history behind it. It is one of the oldest cities in the world, predating London, Paris and Rome by centuries. 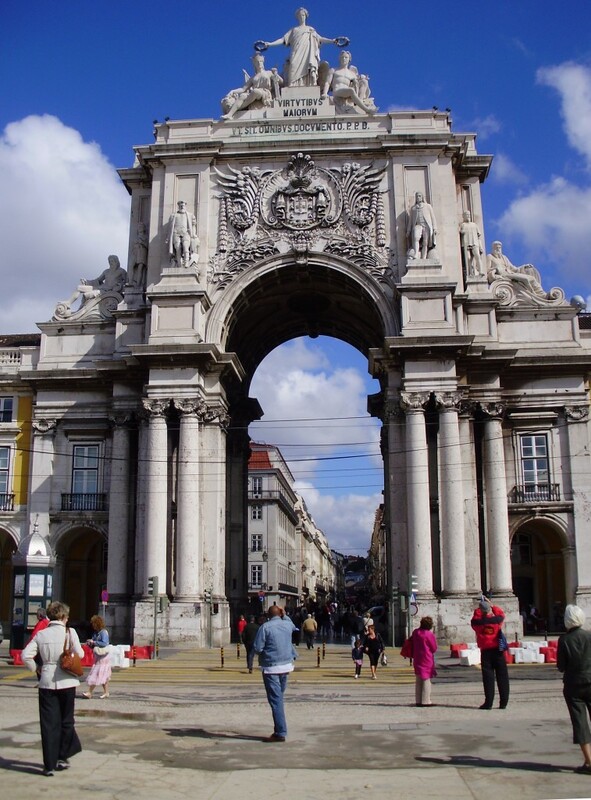 The bus dropped us off at outside the Rua Augusta Arch – the gateway to Old Lisbon. The Rua Augusta Arch was built to commemorate the rebuilding of the city after the 1755 earthquake. The 100 foot high arch is surmounted by a 23 foot tall statue. We passed through the arch into the downtown area, a warren of narrow streets with shops and apartments, as well as large plazas. The area was bustling with activity. It is largely a pedestrian only area though there are trams running up and down the narrow streets and some cars as well. 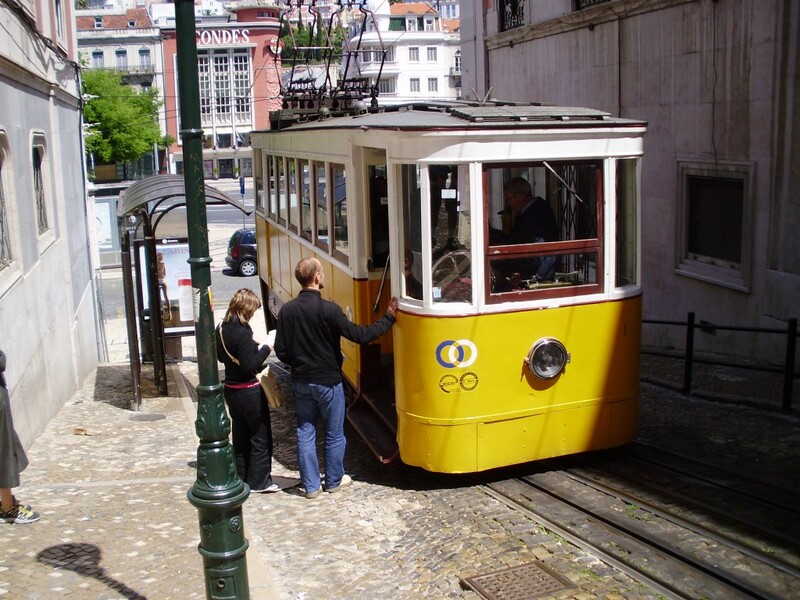 Lisbon also has three funicular trams as the city lies on a hillside sloping down towards the Tagus River. Busy pedestrian mall looking back towards the Rua Augusta Arch. We noticed a large fortress off to our right so we decided to check it out. 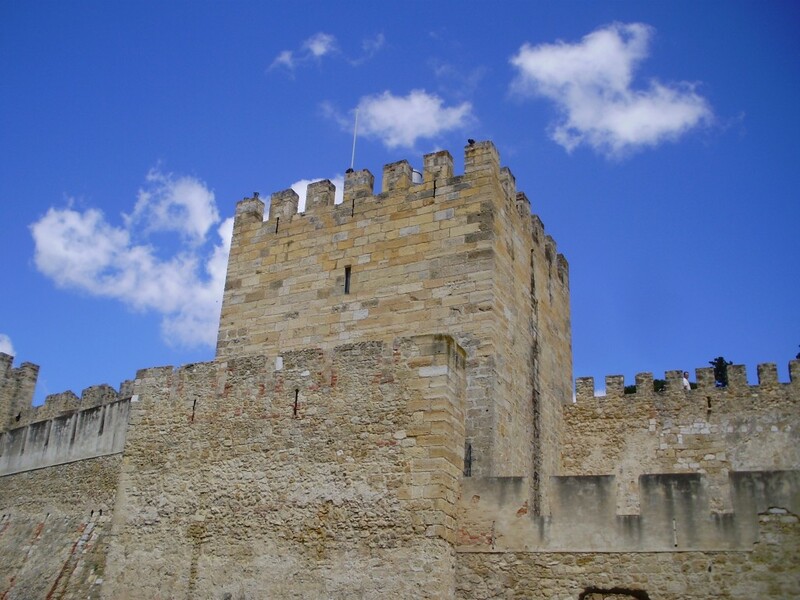 The Castelo de Sao Jorge is in the Alfama district, one of the oldest districts in Lisbon and the only one not destroyed by the 1755 earthquake. 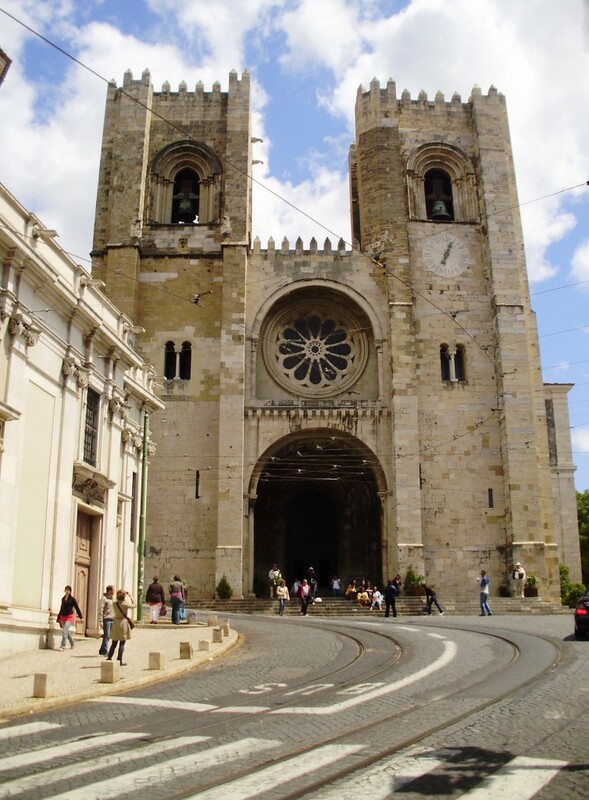 To get there we strolled up some narrow streets, passing the Lisbon Cathedral along the way. 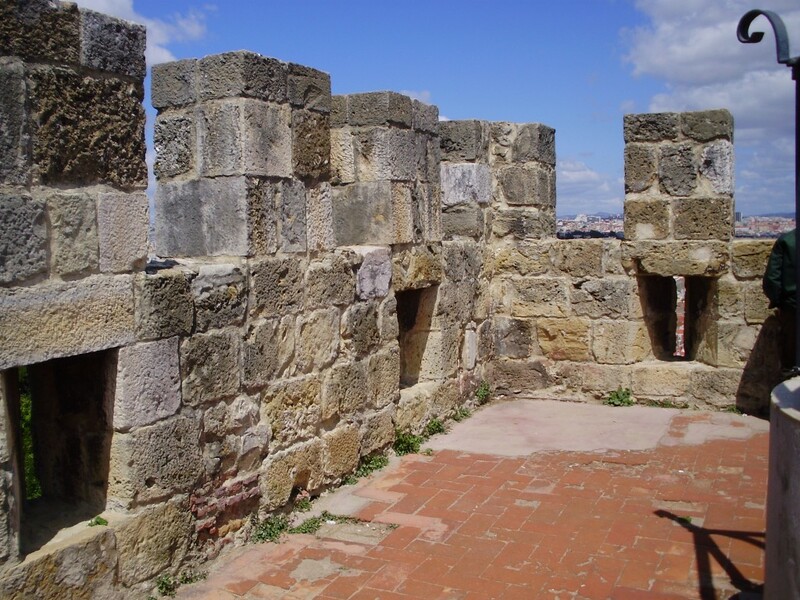 The castle itself is Moorish and was captured by Christian forces in 1147 during the Second Crusade. Lisbon became the capital in 1255 and the castle was renovated and extended over the next hundred and twenty -five years. 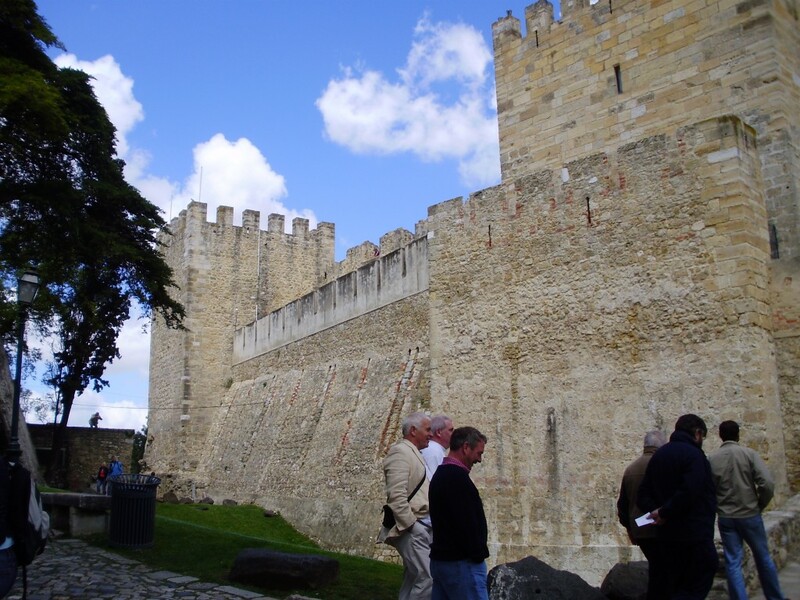 The Castelo de Sao Jorge dates from Moorish times. 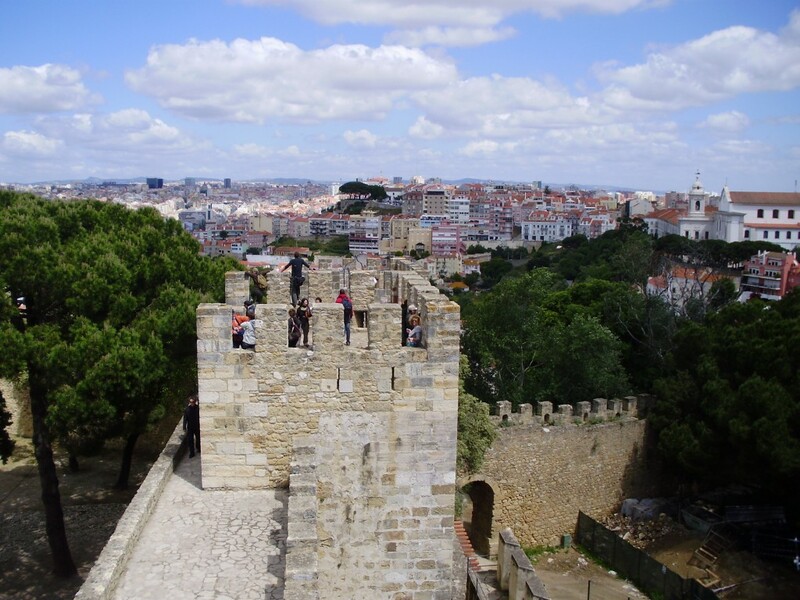 We spent a good while there exploring the castle and walking along the battlements which command a panoramic view of Lisbon. On the castle ramparts with the city in the background. Then we walked back towards the central part of old Lisbon. Along the way we watched as the trams made their way through the narrow thoroughfares. Up the hill from the Rua Augusta Arch we came across the San Justa Lift. 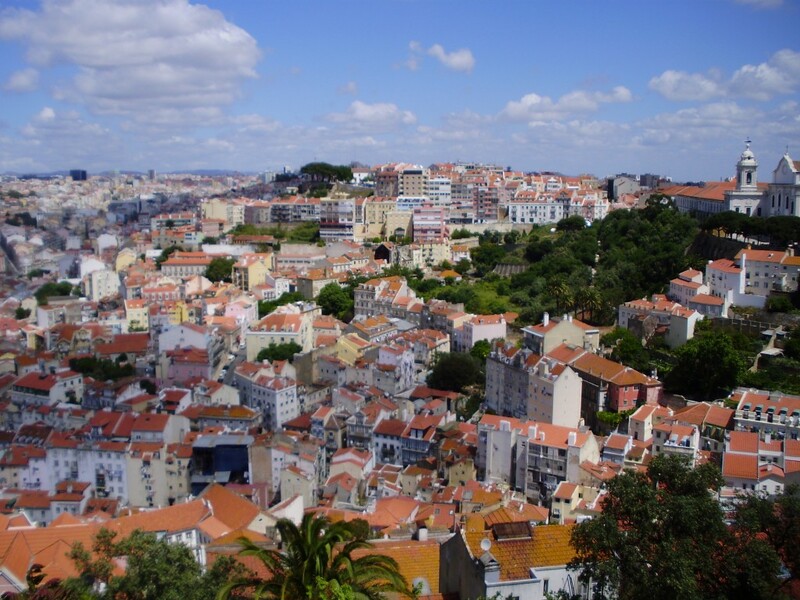 The Baixa district is flanked by steep hillsides, one leading to the Castelo on the right and another to the Bairro Alto on the left. 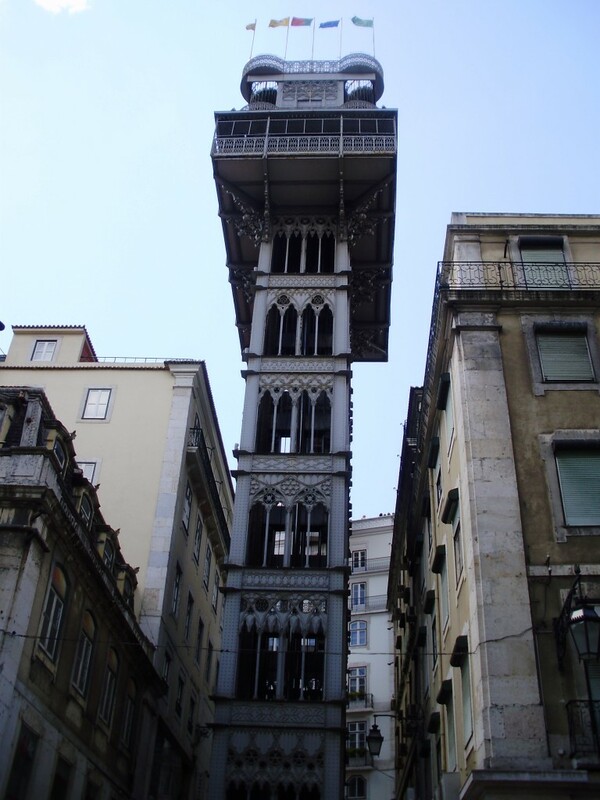 The San Justa Lift takes passengers from the Baixa up to the Largo do Carmo (Carmo Square). Construction was started in 1900 and completed in 1902. Originally powered by steam, it converted to electricity in 1907. It stands 45 metres tall (about seven stories) We did not go up the elevator but did take a funicular later in the day. The San Justa Lift carries 24 passengers at a time from the streets of the Baixa to Carmo Square. Further up the road from the lift is the impressive Rossio Square. The square features a large fountain and a statue of Pedro IV (Peter the Fourth). During the Spanish Inquisition, the square was the site of public executions, the notorious auto-da-fé which saw its victims burned at the stake. 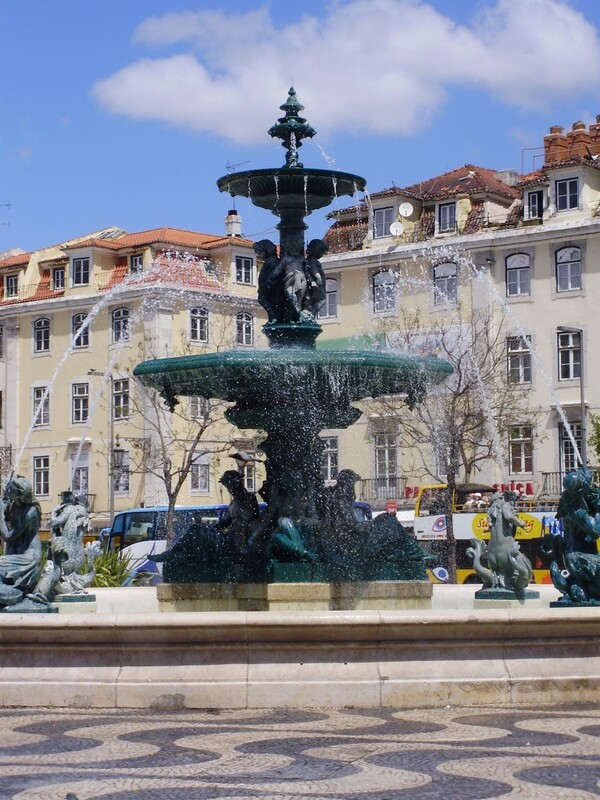 Fountain in Rossio Square. You can see some of the inlaid Portuguese pavement below the fountain. But its most striking feature is the Portuguese pavement. 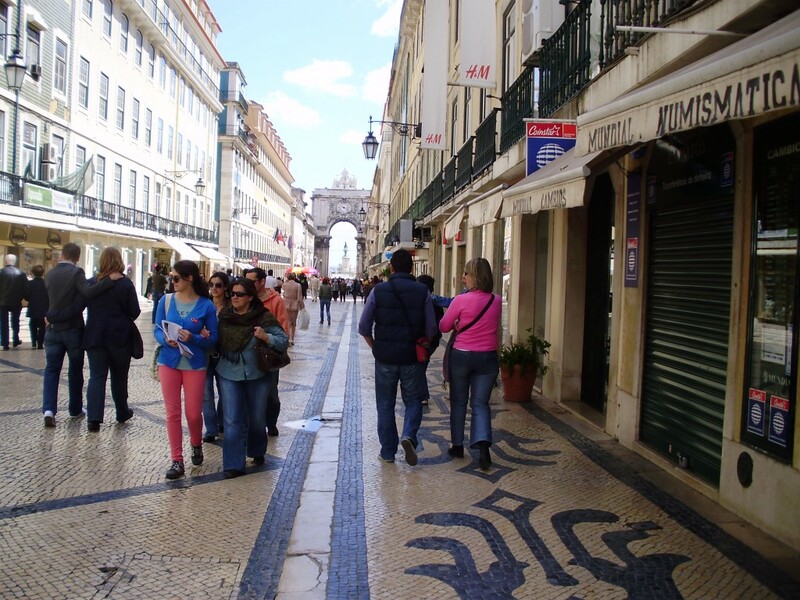 Portuguese pavement is a surface created with inlaid stones of different colours to form intricate patterns. The Rossio plaza is particularly striking because of the optical illusion it gives of waves and motion. You can see in the video below that my camera did not like it much. We wandered further up the hill and came across Lisbon’s Hard Rock Cafe (seems every major city has one!) And across the plaza from the Hard Rock we found the Ascensor da Gloria, one of three funicular trams in the city. This inclined railway dates from 1885. We hopped the tram and later walked back down to the Baixa. Walking back down we passed a little shop whose door was flanked by two carved wooden figures. These figures seem to be popular in Lisbon. We saw quite a few of them at various places. 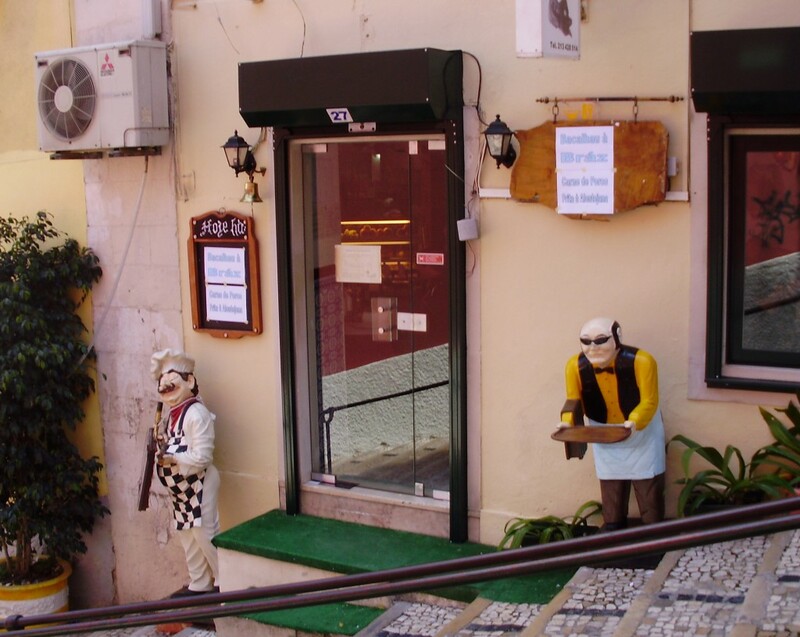 Carved wooden figures flank the doorway of this restaurant. 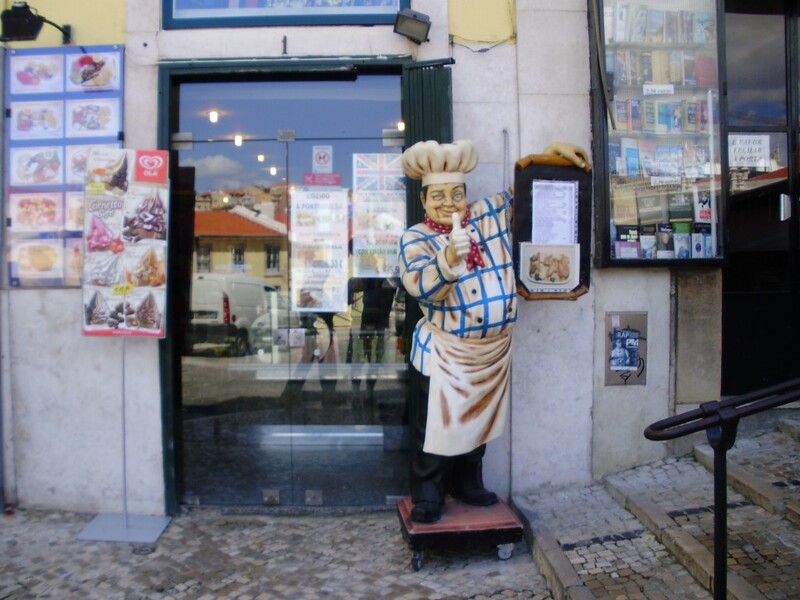 Such figures are popular in Lisbon. Strolling back down to the Baixa from the Bairro Alto. 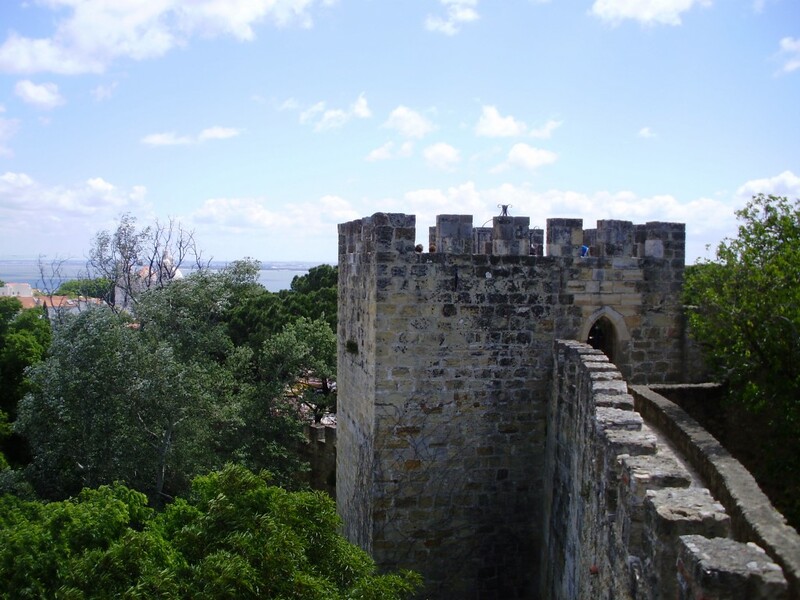 You can see the Castelo de Sao Jorge in the distance. All in all we had a terrific time in Lisbon. A lovely city with many interesting sights. Here are some additional photos of our visit to Lisbon. 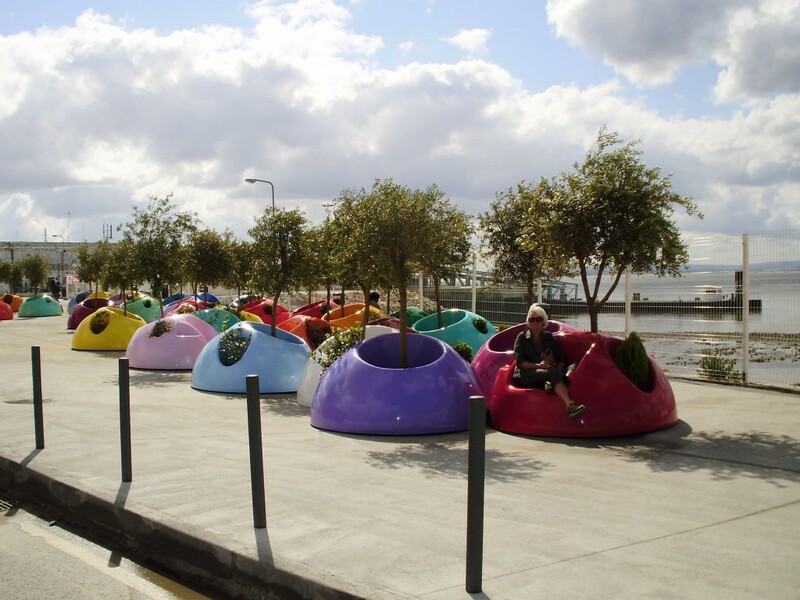 At a park along the waterfront we found these interesting benches before we went into the city itself. 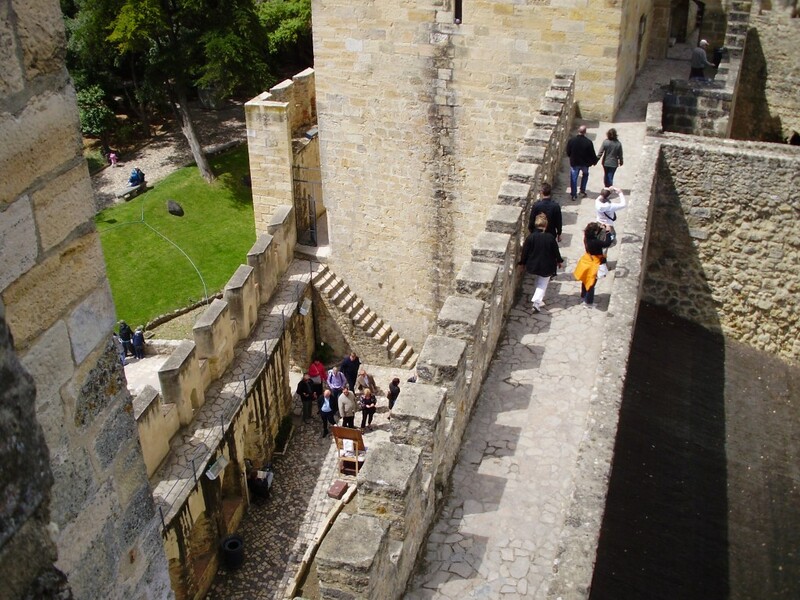 The battlements of the Castelo. One of the turrets of the Castelo. 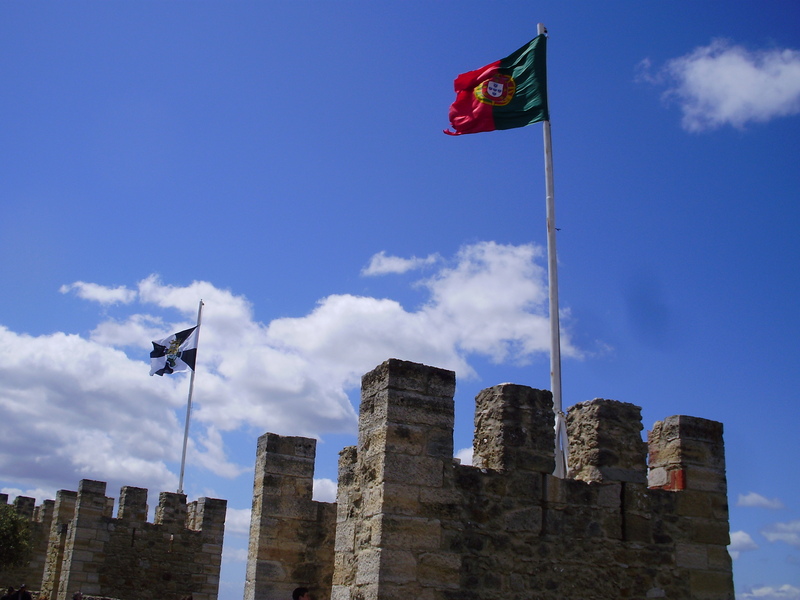 Flags flying above the Castelo. The battlements had narrow slits for snipers to shoot through. 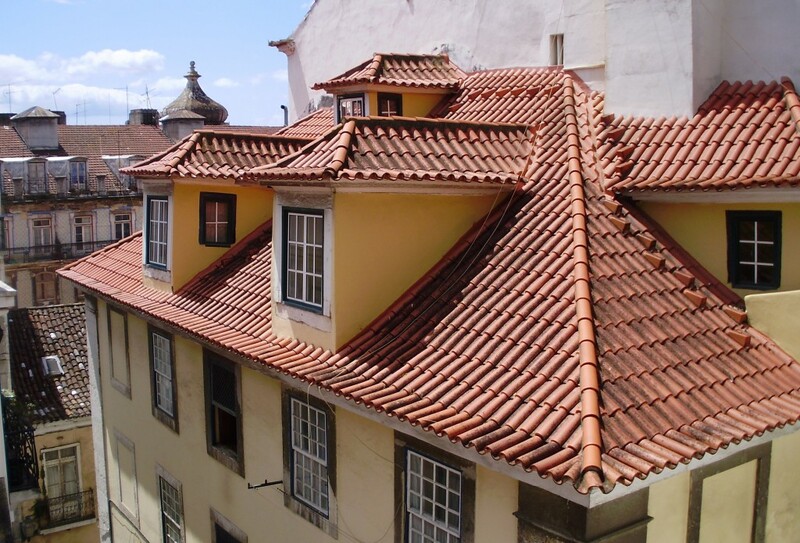 Most of the buildings in Lisbon have red tile roofs. 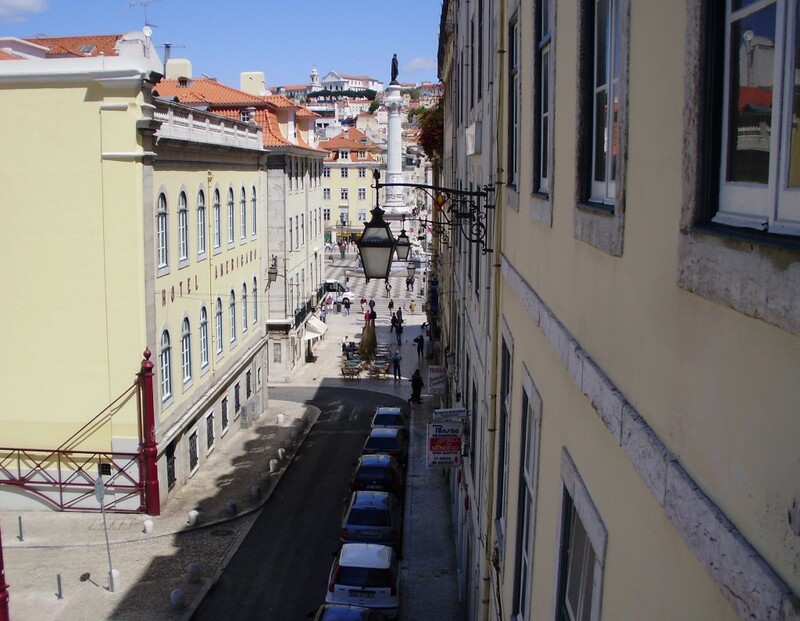 Streets are narrow in parts of Lisbon. 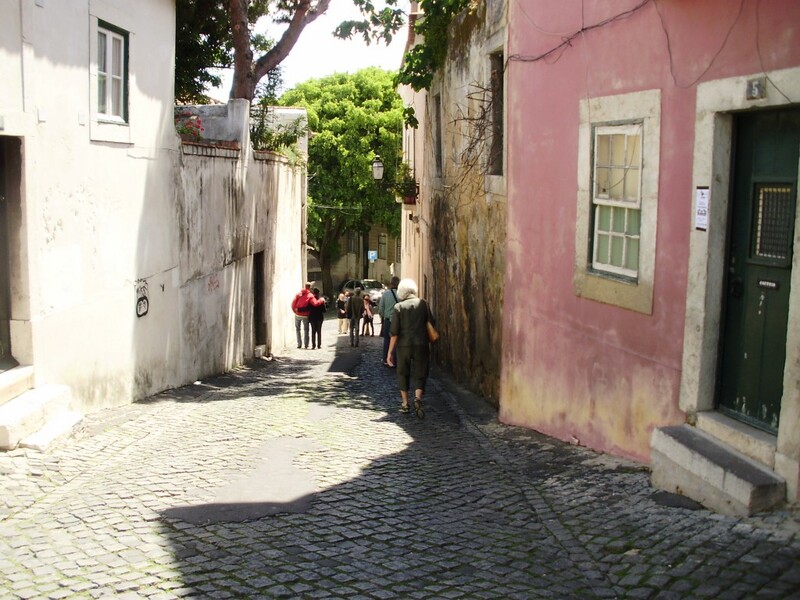 Heading back to the Baixa district from the Castelo de Sao Jorge. 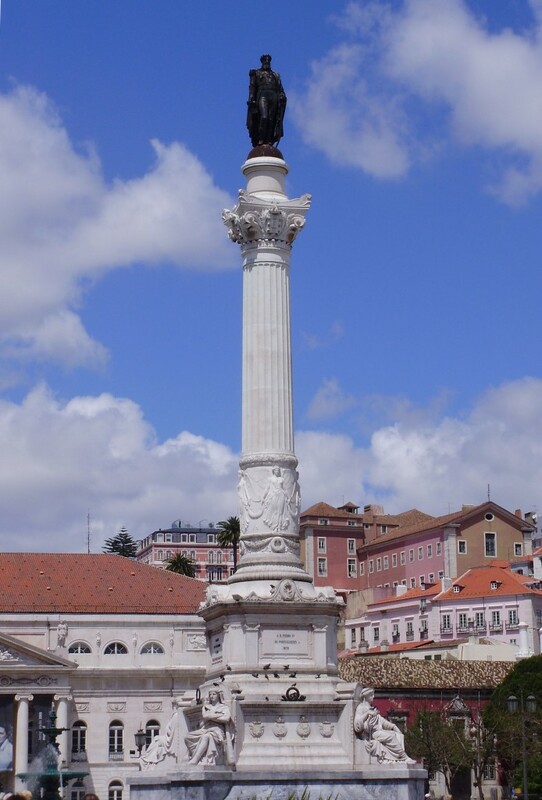 Statue of Pedro IV in Rossio Square. 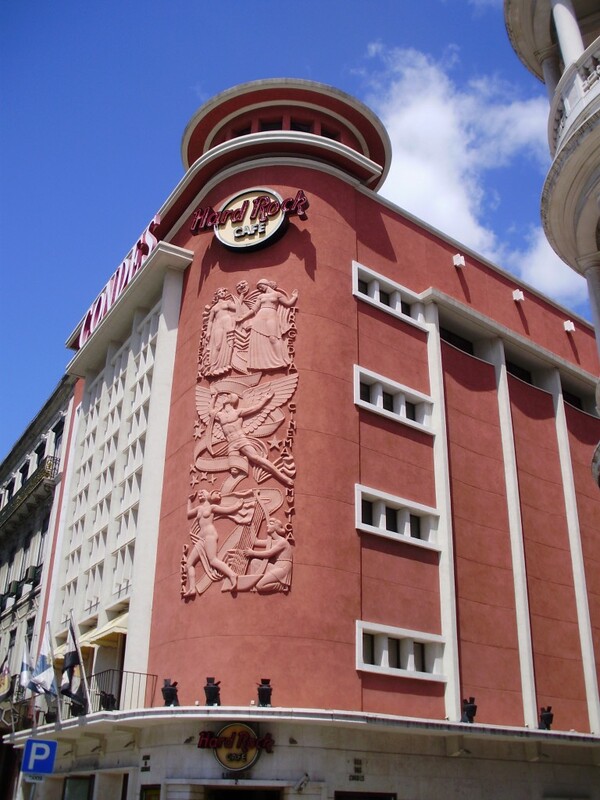 Lisbon’s Hard Rock Cafe. Seems every major city has one! 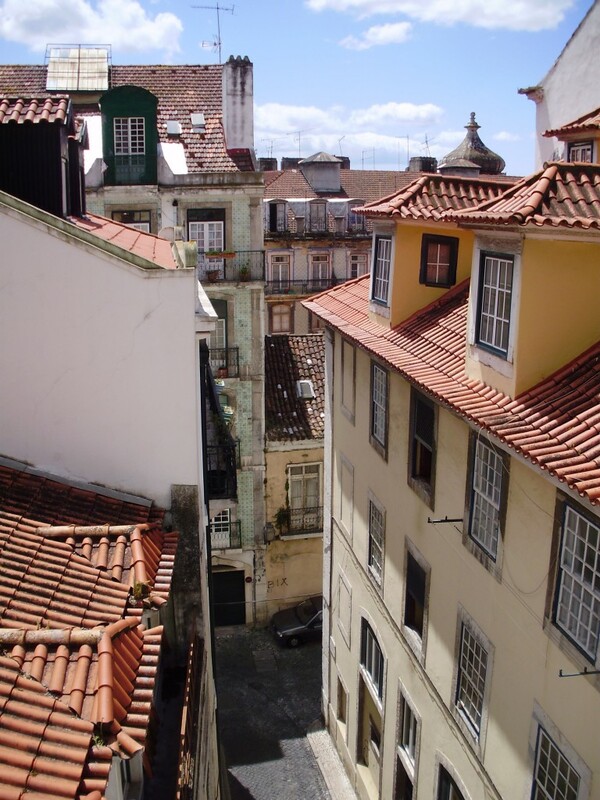 Looking back down towards the Baixa district. Another carved figure, this one outside a bakery. 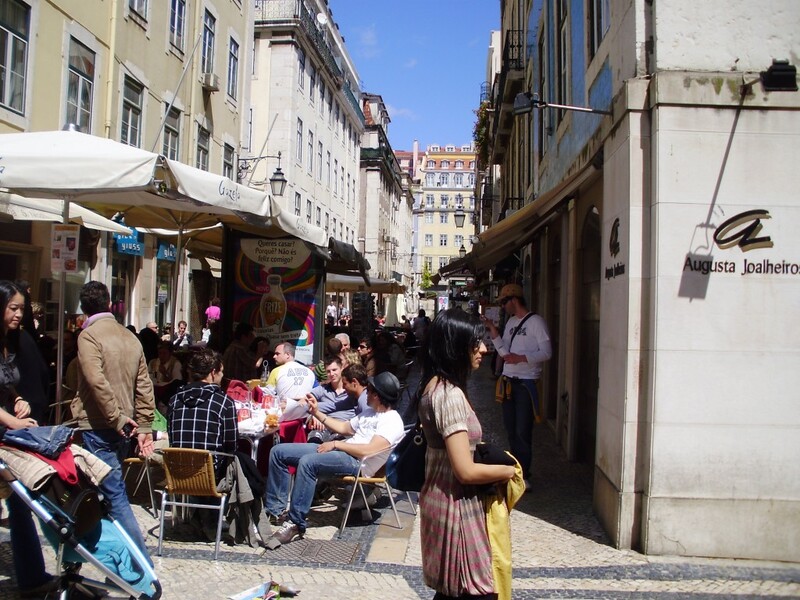 Lots of sidewalk cafés in Lisbon. 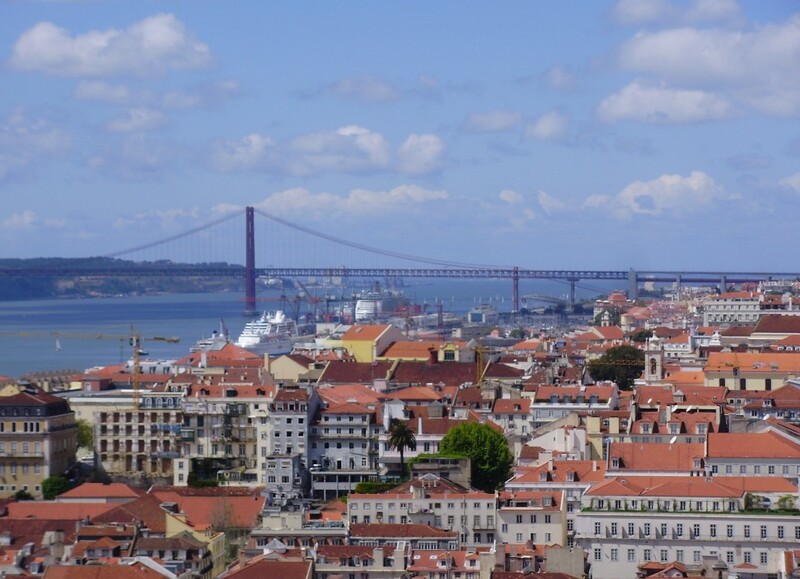 A last panoramic view of Lisbon.